After payment you get a link by which you can get the license key of the game Overcooked! 2 from the official supplier - the company "Buka", to activate the system STEAM. Want a little culinary madness? Grab your best ladle, arm yourself with a book of recipes and boldly jump into the open portal of the studio Ghost Town Games Ltd to the wizards of Team17 Digital Ltd. Here, talking foods and gay loaves will turn the process of cooking into a real madness, filled with simple humor and bright positive. Overcooked! 2 - continuation of the famous team arcade about brave chefs and their assistants. Improved combo mechanics and global network mode have combined starters and culinary experts from around the world under their authority. Become a part of the community, where not so much tasty food, but also give unforgettable emotions, buying a game in our store. From the Onion Kingdom in your on-site restaurant came the news that an army of zombie loaves attacked the unfortunate vegetable residents. Hellish hunger shakes the neighborhood, the bread seizes more and more areas, absorbing everything in its path. The king is in despair. He calls upon four chefs, brave defenders, to cook the most delicious dishes in the world and destroy the insatiable loaves with the help of cooking magic. Many settlements and cities need heroes! Cook tasty and fun using all the tools and magic of friendship. Madness with spices. Fight in the company of friends on the global map, getting an unprecedented amount of points and earning bonuses. 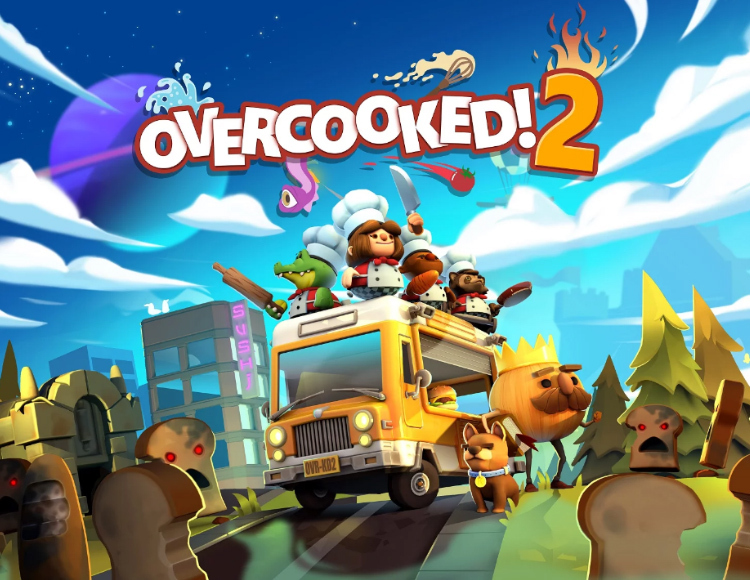 Arrange a lively competition, destroying zombies for time or skill, traveling around the Onion Kingdom and learning the new pages of your cookbook. Any gourmet will appreciate. Try tastes worthy of real gourmets. Cook sushi, burgers, stews, delicious cakes and buns. Do not forget about the salad and killer roast! Reveal the secrets and do not leave the enemy a single chance to crush you with quantity. Satire and vegetables. Overcooked! - a game for the whole family. Here, seriousness and sadness have no place. Play together with those who are dear to you, study the crazy world of the Kingdom and get acquainted with its unusual inhabitants. Become a world chef, and let others envy you!